I once read about a custom to ensure that a baby is born on ancestral land. Families bring a basket of dirt from their farm or homeland and place it under the hospital bed where the baby will be born. I have also read about babies being given a tiny taste of garden soil at birth. It isn’t just the cultural ties that are bound in these acts, but also the inoculation with and exposure to microbial life, where the outside ecosystem populates and strengthens the inner ecosystem. I know some of my family members are pleased to know that we did not follow these customs when our daughter was born in a hospital, but if we did, then she would have been given a blend of soil from many places. Ancestral homeland is a tricky thing for North American mongrels like me. Studies have shown that early exposure to dirt can help lower the risk for auto-immune diseases. Even without this dirt inoculation, my daughter’s immune system is tough as nails. Maybe it is because she has always been active and energetic, needing to be outside surrounded by dirt and mud. Last year we were pleased to discover a play-based preschool near our house. It is a garden school with a huge yard, a sandbox, lots of plants, and a few chickens. If the children are not interested in structured activities, they can play outside, rain or shine. Our daughter loves her school and can't arrive there quick enough; she runs to school in the morning to gather eggs. Sometimes these gathered eggs are used in their morning group activity: Baking muffins for their morning snack. Our daughter is clearly thriving in this environment. Our soil contains the cycle of life, and sometimes our immune systems are tested. As much as we love this preschool and all our new friends, the downside has been the introduction of new germs. I recently succumbed to a stomach virus that tormented me for two weeks. Toward the end of the illness, I remembered that strawberry leaves can help ease nausea. Strawberry leaves make a good spring tonic. It is usually fine for pregnant or nursing mothers to consume strawberry leaves (see my cautions below). They are also good for young tummies, though little ones may prefer to sip chilled tisane, with a few chamomile or red clover flowers as garnish. I made a couple batches of tisane during the course of this illness. For my first batch, I gathered some strawberry leaves to make a quick brew. The next day I used a blend of strawberry leaves, red raspberry leaves, lemon balm, motherwort, chamomile, and California poppy. To relieve nausea, I think I prefer the plain strawberry leaf brew the best. If you use hot water pour it over the herbs; let it steep for a few minutes. If you are using cold water, pour over and let the brew sit it the sun for an hour or so. Strain into cups. The strained brew will keep in the refrigerator for a few days. It is a nice brew to sip cold. To make it fancy, add some herb or flower filled ice cubes. Caution: Although I wish I had access to fresh strawberry leaves when I was in my first trimester of pregnancy, I should include some warnings here. If you are pregnant or breastfeeding, it is always best to make certain a herb is safe to use before consuming it. If you have a medical condition or are on medication, it is always best to see if there is a contraindication before consuming herbs or flowers. For example: California poppy and motherwort both influence the circulatory system, so I think it is better to be safe than sorry. Also, it is important that you make this tisane from fresh leaves or completely dried leaves, as both strawberry and raspberry leaves can cause stomach distress and nausea when consumed when they are halfway between fresh and dried. The other day this section of Robert Frost's poem, Stopping by the Woods on a Snowy Evening came to mind and I felt a strong longing for winters past. When I was in grammar school my family lived in Vermont, in a small town that Robert Frost once lived in. I never tired of the woods that surrounded our home. In the woods was a network of trails that in winter were lined with snow heavy trees. I can still smell the sap of the white pines and see the flash of red from cardinals flying across the snow. I loved to walk and showshoe along the trails. The thing I remember most is the lovely sound of being alone in the woods with only the whisper of snow hitting the ground. Robert Frost captured this sound perfectly in his poem. Later, when we moved across the border to New York state, on snowy evenings I would head out into the darkness and ski through our tiny village to enjoy the snow falling under the street lights. On snowy nights it was just me and the occasional snow plow. So peaceful. When I was young I would push my limits out in the cold. I would skate, ski, and build snow forts until I was numb and frozen to the bone. I loved the ritual of coming in from the cold. First the rush of warmth as I removed my snowy mittens and hat, then my boots, snowsuit or snow pants, and coat. I would run upstairs in my bare feet and thermals, bundle up in a wool sweater and jeans, and head downstairs to bask beside the woodstove and remove the snow that was encased in my braids. My mom would sometimes have a warming bite ready at the table. I loved a hot grilled cheese sandwich, a mug of tomato soup (always with milk), and a homemade pickle. Today I am not a tomato soup fan, but I think if I were chilled to the bone, I would really crave a cup. I think the best warmer was a mug of hot cocoa with whipped cream or mini marshmallows. Here in Portland, the cold is different. It doesn't usually dip below freezing, but there is the dampness, the ever present dampness. But less so this year. It is surprisingly dry. And with this dryness comes sickness. The past week or so Mr. Graham and I have been fighting colds. Nothing bad, just a persistent scratchiness in our throats. I usually make some lemon and ginger tisane with thyme honey. Sometimes I add a little brandy or whiskey to, um, accelerate the healing process. Since we have had a few toddies recently, I thought it would be fun to map out my toddy making process. There are so many ways to make a healing brew. And alcohol is not required. Alcohol is dehydrating, so please listen to your body! Let's come in from the cold and warm up. This is more a process and not so much a recipe. The process depends on what you have on hand, what you are craving, and what type of healing you require. 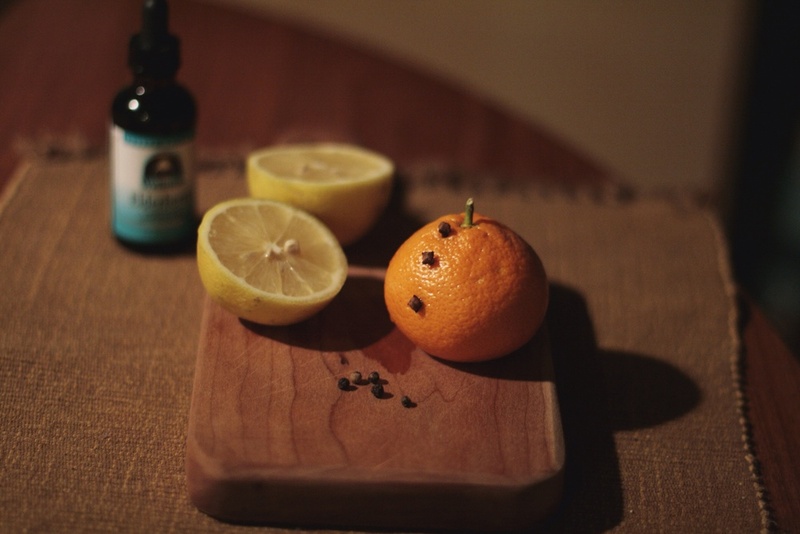 Citrus: I try to have some sort of citrus on hand in the winter. It is citrus season, and isn't it nice to have a taste of sunshine in the deep of winter? For toddies I mostly use lemons, but limes, oranges, and even tangerines are all good. I cut them into quarters and squeeze one or two quarters in each glass. If you are feeling fancy, you can pierce each quarter with 2 or 3 whole cloves. Just keep in mind that those little cloves have a huge personality, and can really alter the flavor of your toddy. They can also make your mouth numb. Ginger: Ginger is warming, but it is also drying. If you have a dry cough, or are even slightly dehydrated, skip the ginger. If you use ginger, use a small to medium knob, peel the ginger root with a spoon or a vegetable peeler. Slice the root into thin pieces. Healing Fruit: Elderberries, cranberries, pear or apple slices, blackberries, apple cider, or rosehips. You can add them as whole fruit, slices, elixirs, or liqueurs. I usually add fresh fruit to the tisane (see below). Add elixirs and liqueurs when you add the booze. Bitters or Tinctures: Sometimes I like to add a dash of medicinal bitters or a dropperful of an immune boosting herbal tincture. You can make your own tinctures, but they are also available in health food stores. Hot Water, Your Favorite Tea, or a Tisane with any of the Following Healing Herbs and Spices: Thyme, astragalus, echinacea, anise seeds, fennel seeds, yarrow, schizandra berries, elder flowers, dried hibiscus flowers, rosemary, pine needles, spruce needles, mint, lemon balm, hyssop, sage, mullein, horehound, black peppercorns, chili flakes, cardamom pods, cinnamon sticks, dried citrus peels, wild cherry bark, marshmallow root, slippery elm root, cloves (just one or two whole cloves), a pinch of cayenne - to name a few. I use a good sprig or two of fresh herbs, and a teaspoon or two of dried. You can experiment with one or a few items together. This will not all taste good together, so use your intuition. For tea: I love oolong, Russian Caravan, green tea, Assam tea, white tea, or herbal. The possibilities here are endless. Honey or Maple Syrup: Use the freshest raw honey you can find. Honey really soothes a scratchy throat. Honey is hydrophilic, which means it attracts moisture. That is why it is so good for your skin too. I love thyme honey the best, but the flavor is a bit strong, so it won't work well with competing flavors. The best sources are specialty markets where it is usually imported from Greece or France. Maple syrup contains many micro-nutrients and it is my favorite sweetener. You can take the girl out of the East Coast, but you can't take the East Coast out of the girl. In a small saucepan boil water, or make a tisane. For water: boil 2 cups. For a tisane: Add your herbs, spices, ginger, and fruit (I don't add fresh citrus to the tisane - I prefer it uncooked). Add 2 cups of water to your herbs and spices, and simmer on low-medium heat for 10 - 15 minutes. For tea, brew a small pot to make two cups. Strain your tisane or tea into two mugs or glasses, leaving enough room in your mug for the remaining ingredients. Add the honey or maple syrup now and stir well. I cut a lemon into quarters and squeeze a quarter or two of lemon into each mug and drop the fruit in. Give each mug a good stir. At this point you can add a dash of medicinal bitters or tincture in each mug. Or not. You can also add an ounce or jigger of booze and a splash or two of fruit liqueur, if you are using any. Traditional: Hot water or tea, quarter of a lemon, honey, cinnamon stick, whiskey or rum (Try with Russian Caravan tea and a peaty scotch). To Soothe a Dry Cough: Make a tisane with fresh pear slices, a small sprig each of rosemary and thyme, 2 sage leaves (I like to add fresh spruce needles or rosehips if I have them, but not necessary). Use lemon for citrus. Your favorite honey. Optional: Calvados or brandy. Digestive: Hot water, quarter of an orange, honey or maple syrup, cardamom bitters, and a good splash of Becherovka or Fernet Branca. Delightfully bitter. Not for the squeamish. Consider yourself warned. To Warm Up and Nip that Cold in the Bud: Tisane with plenty of fresh ginger root and a pinch of cayenne, lemon squeeze, thyme honey, add whiskey or brandy if desired. Elderberry Sage: Make a tisane with 2 - 3 sage leaves. Add a squeeze of a quarter/half lemon, add honey to taste, two teaspoons of elderberry elixir, half ounce of brandy or tequila, and half ounce of Clear Creek blackberry liqueur. Great for a sore throat. Do you have a hot toddy that you enjoy this time of year? PS: Perhaps you are wondering why I am posting about hot toddies and not something more appropriate to the day. How about a Ramos Gin Fizz or something sparkly and elegant? It is New Year's Eve and on this day I like to relax and light candles; reflect on the year that has past and look forward to the year ahead. I have never liked the pressure of New Year's Eve. I don't like going out or having a party. Tonight I will stay home and watch movies, get under a warm blanket, and enjoy a dram of scotch, or a warming toddy. So whatever you do tonight, have fun and be safe! Happy New Year!